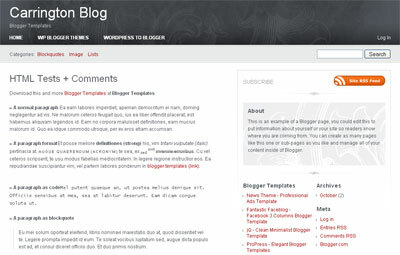 Here is new simple and nice looking template for your blogger blog. It's called Smart Gradient Blogger Template. The colour of this template if perfectly match with your adsense advertising optimatization. Smart Gradient is clean blogger template with 4 columns with 2 columns right sidebar, includes space for a banner advert and one column on the left sidebar. There is plenty of ad space for your banner. This template was made for blogger Dody farial. Take a look at the demo and if you like it, you can download it below. In Labels: 4 Column, Adsense Friendly, Fixed Width, Left sidebar, Right sidebar, White on 20 April, 2010. I'm really sorry for not being active for the past 4 months. There's alot of stuff in my real life and i figured out how i earn money online without must wait for my adsense. My adsense earning isn't right and i have no idea why i can't have a good earning from adsense +_+. For the next day I'm trying to add some of my experience here with other program, not only from adsense. Well btw, nice to see u guy's. 2. High Pay Rate System. For More informaton you can register here. The good things it's really work well with me and they already pay me around 13 times on time. The latest payment just arrived today and i though i may share it to all of you. 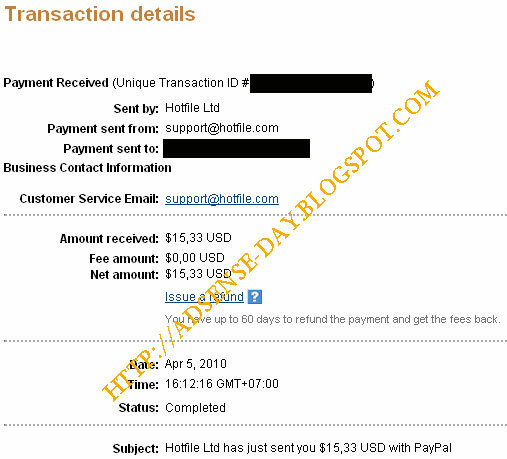 So if you're want to try something different then just register on hotfile and made your money every week. See U. In Labels: Blog-Update on 05 April, 2010. 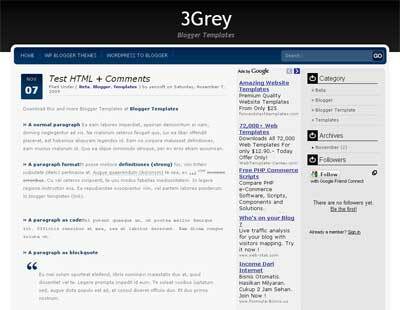 3Grey was originally a wordpress theme designed by skinpress and bloggerized by wpbloggerthemes. 3Grey is clean blogger template with 3 columns with 2 columns right sidebar, includes space for a skyscraper banner advert. The navigation bar comes in a dark blue to lighter blue gradient. If you would like to experiment with skyscraper adverts alongside your blog updates then take a look at this well designed theme. Avatar in comments and after jump feature are also available. In Labels: 3 Column, Adaptation of Wordpress, Dark, Right sidebar on 09 November, 2009. WOW, good news, blogger. 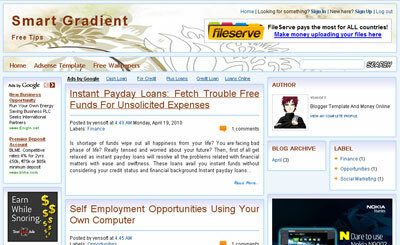 The high quality adsense theme designed by doshdosh has been converted to blogger by freebloggertemplate.info. Bluesense template colors are perfectly blended with Adsense units on both homepage and single post pages for a maximum click through rate. BlueSense maybe looks like amateur, but i bet you'll have maximum click through rate. 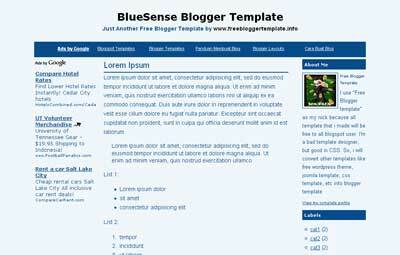 Bluesense Blogger template come with 3 columns with left and right sidebar. In Labels: 3 Column, Adaptation of Wordpress, Adsense Friendly, Left sidebar, Right sidebar on 06 November, 2009. 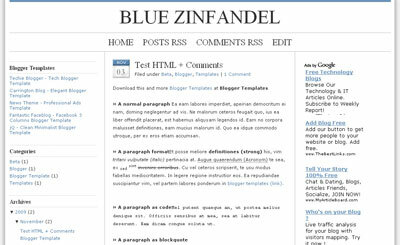 Blue Zinfandel is a 2 or 3 column template originally designed by Brian Gardner for wordpress and bringing to blogger by WpBloggerthemes. Blue Zinfandel is clean and simple template designed for online newspapers, Articles or magazines. goto Layout > Page Elements > edit Blog Posts > change time format to long date (e.g Tuesday, June 23, 2009). Remember, change time format NOT date format. Find code below in your template. In Labels: 3 Column, Adaptation of Wordpress, Adsense Friendly, Blue, Left sidebar, Right sidebar, White on 03 November, 2009. 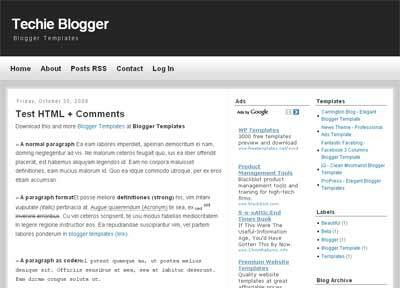 Techie Blogger is another simple and clean blogger template designed by deluxetemplates. It has 3 columns with 2 columns right sidebar. The color is about black and white. I like Techie Blogger template because it was so simple but all new blogger feature already embedded just like after-jump and avatar in comments form. Change "#" to your URL and change other titles. All done Enjoy new template. In Labels: 3 Column, Adsense Friendly, Elegant, Right sidebar, White on 30 October, 2009. Carrington Blog is originally designed by crowdfavorite and converted to blogger by wpbloggerthemes. Carrington Blog Blogger template with 3 columns, right sidebar, with simple and elegant design. I added some blogger feature in this template just like "after-jump" or new readmore feature for blogger already embedded. 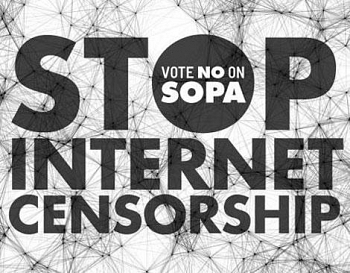 There is no need to setting other feature just upload it and use it for free. The template ready to use. Enjoy the templates. In Labels: 3 Column, Adaptation of Wordpress, Elegant, Right sidebar on 29 October, 2009. 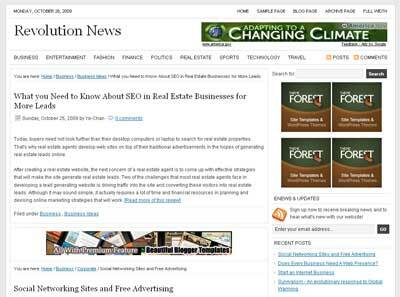 News theme Blogger Template is Professional Ads Template suitable for news related blog. For those who actually made an massive update everyday for their blogs, Check this out. News Theme come with simple color design, Fastest loading, 3 columns, Right sidebar, Fully widgetized, Avatar comments enabled, New Readmore or Jump-Link for blogger also enabled and lot's of feature included. News theme based on a wordpress Premium theme designed by StudioPress and has been bloggerized by Bloganol. Find Code below and change the links and title with your own. Find Code below and change it with your own ads or banner. Find Code below and Change the red code with your own feedburner id. In Labels: 3 Column, Adaptation of Wordpress, Ads Theme, Adsense-Template, Premium, Professional on 25 October, 2009. Copyright © 2009 Adsense Blogger Templates. Designed by Internet Bingo. In collaboration with Rummy Royal, Costa Bingo, and 32 Red Casino | Blogger by Blogger Template Place.